Camping is one of the best ways to kick back and relax and a decent tent is something you always need to focus on when it comes to this. Without a good tent, you will be left stranded in the cold and vulnerable to all the elements and this could potentially spoil the trip and should the tent give in under the weather, everything you carried along could be compromised. 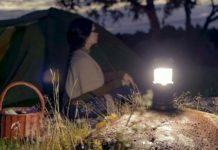 We have set out to look for the best 6-person tent and find out exactly what sets them apart from the rest of the competition, we have also included a thoroughly researched buyer's guide that should enable you to get the best possible value for your money when searching for a tent elsewhere. - Summer/Screen: These tents are designed to provide you with excellent ventilation and to keep bugs from entering your tent. They are generally lightweight and designed for hot conditions. - Three-Season: These tents focus more on versatility and they are designed to keep you dry and cozy. They might not be ideal for extremely cold weather, but they offer great value for your money. - Convertible: The convertible tent is perfect for backpackers not knowing what conditions they will face. Much like the Three-Season ten, they can be used in virtually any weather conditions, but lack protection from extreme cold. - Mountaineering/Winter: These tents are made from sturdy poles and extremely tough fabrics. They are perfect for those scaling mountains and enduring the cold of the Arctic. However, they are also a little more expensive and heavier to carry around. - Tarp: The tarp is designed for the super-minimalist and since it does not offer great protection, it is lightweight and provides perfect shelter for backpackers. The ﻿tarp also has multifunctional use and can be used as an extra layer of protection over your tent. - A-frame: This is a light and inexpensive shape designed for backpackers. It comes with sloping walls and limited head and elbow room, thus lacking some comfort. 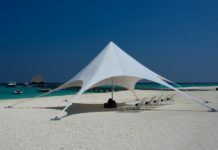 - Modified A-Frame: Shaped like the A-frame, this tent features a sturdy pole in the middle and curved walls. It works similar to the A-frame but offers much more internal space. - Dome: The Domes-shaped tents are quite large with high-arching walls. They are perfect for storing your belongings and they offer a ton of internal space when compared to the A-frame. - Pyramid: The pyramid tent includes a rain fly with a pole in the middle. It comes down steeply on each side and this offers decent space while countering the buildup of water and snow. - Hook/Tunnel: These are the perfect tents that offer you a combination of lightweight and protection. The downside is that they need stakes to be secure on the ground and the setup can be quite troubling. - Wedge: The wedge tent is the ultimate aerodynamic tent and it is higher at the top, with a steep comedown. These tents are perfect for extremely windy conditions, but they do lack internal space. The floor space is one of the main things you will be looking for. With limited floor space, your possessions might need to be left outside. When choosing a 6-person tent, you will need to look for even more space as each person will have their own set or bag of personal possessions. The headroom will play a major part when it comes to overall comfort and the more headroom you have, the easier it will be to sleep at night. The headroom should be large enough for each person to add a pillow as you will not care so much for lightweight as someone looking for a tent for backpacking long distances. - Double Wall construction: This is the traditional way the tents are constructed and the double wall offers great durability and ventilation. It is a little harder to set up, but will also keep you much drier in wet conditions. - Single Wall Construction: This method includes a single wall made from waterproof, yet breathable materials. It is much lighter and easier to set up but also commands a more expensive price. Last but certainly not least, you will need to look at the pole materials and the overall materials to ensure durability. Carbon fiber, aluminum, and fiberglass will be your choices and while carbon fiber is the most durable, it is the most expensive as well. We would recommend aluminum to the average camper for a great combination of quality and affordability. 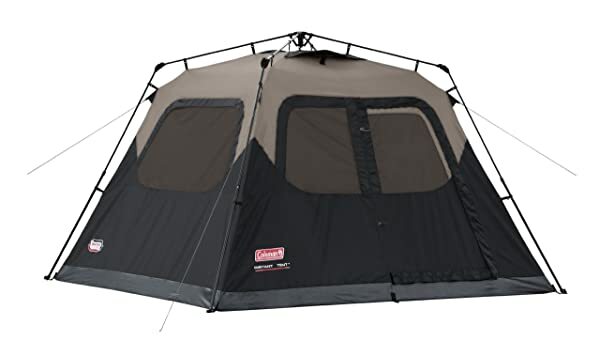 The Coleman Sundome 6 Person Tent is first on our list and it is one of the truly reliable tents. It is made from polyest﻿﻿er and features a spacious dome design. The WeatherTec System is one of the top Coleman features that keep the water out and your belongings dry. The dome design is quite easy to set up and this will take less than 10-minutes. With multiple storage pockets, the tent keeps gear organized and with large windows, it will offer good ventilation to keep you cool in warm weather conditions. With a reasonable price, the tent is perfect for 4-6 people and should be able to fit 2 queen-sized airbeds. The Coleman Evanston Screened Tent is next on our list and it is somewhat more expensive than the previous tent. It is constructed from durable Polyester Tafetta 75D and includes the same WeatherTec system found in the previous design. The tent takes somewhat longer to setup, but as you become accustomed to the design, you should have it up in around 10-15 minutes. One of the best features seems to be the additional "sunroom" feature and this is perfect for taking a nap in the sun during the day. This stylish design will be best used by someone more adept at regular camping. It includes the WeatherTec system to keep you dry in wet conditions. 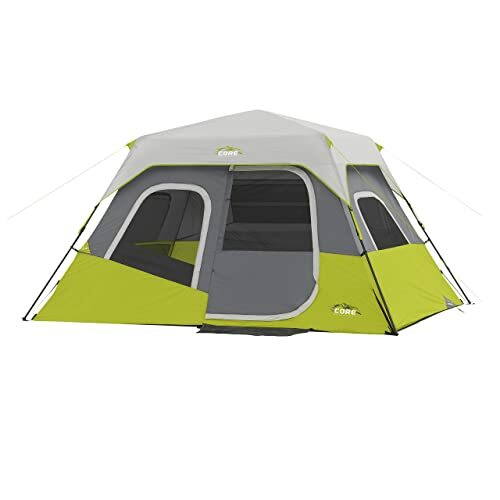 Moving up in the price range, we find the Coleman 6-Person Instant Cabin and this tent is constructed from 150D polyester and taped seams. It also includes the WeatherTec system but does command an expensive price because it sets up in under one minute and is lightweight to carry long distances. The tent is quite high in the middle and after testing out; we found that the head and elbow room seems to be quite extraordinary. It also comes with an integrated rain fly and this offers great ventilation as well as another layer of protection. 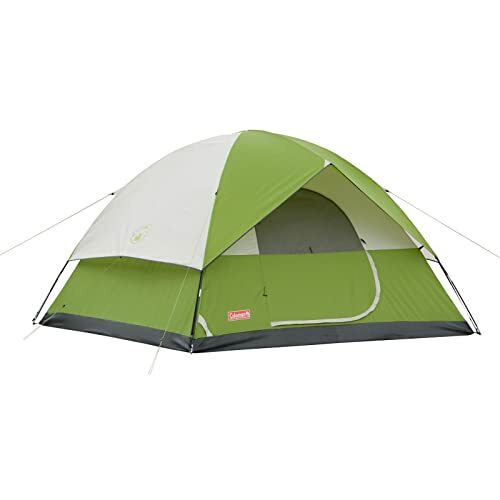 We would definitely recommend this tent to the avid camper or camping family, but it also seems useful to backpackers. Resisting weather conditions should never be an issue with the Coleman WeatherMaster 6-Person Tent. This tent is quite large and the internal space measures 11 x 9 feet. Much like the other Coleman tents, it is made from durable polyester and includes the WeatherTec system designed to keep you dry and impervious to the weather. It also features the instant setup feature, enabling users to instantly set up the tent in under 1 minute. The additional screen room is also perfect for relaxing and keeping the bugs out on hot sunny days. We would certainly recommend this tent to anyone looking for a stylish tent and enjoys camping often. The CORE Instant Cabin Tent is a 6-person tent, designed to set up in less than 60 seconds. It is constructed from durable polyester and includes the CORE H2O Block technology that makes it impervious to rain and other weather conditions. An adjustable ground vent has also been fitted for ventilating the water and the lantern hook should provide you with some place for your lighting equipment. 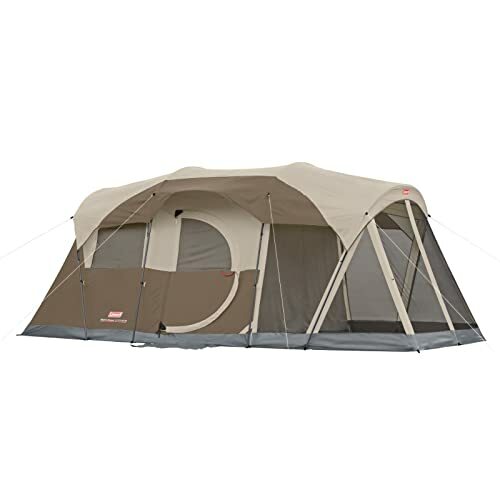 The tent features an electrical chord port for camping near electrical charge points and this can be fully closed when not in use. 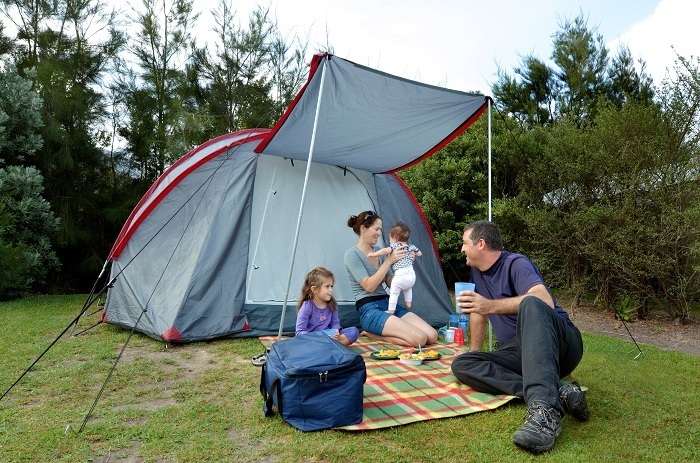 Compared to some of the other top tents, it is quite expensive and should be perfect for the avid camping family. 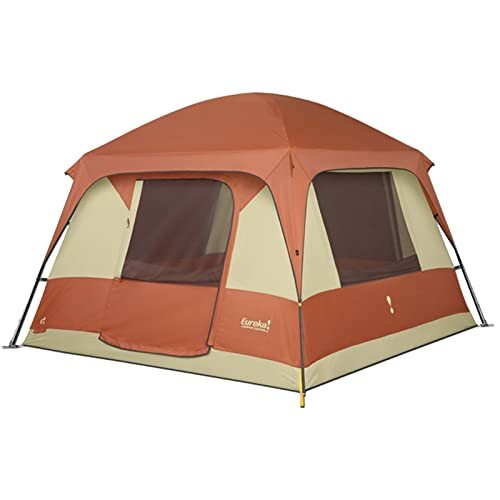 Last but certainly not least, we have the Eureka Copper Canyon 6 Tent and this cabin style tent is lightweight and made from affordable fiberglass poles, with polyester for the materials. It features a large internal space and multiple mesh windows that should provide you with excellent ventilation on your trip. The tent takes quite a while to set up, but with ample interior space, you should easily fit 6 people inside with all their belongings. 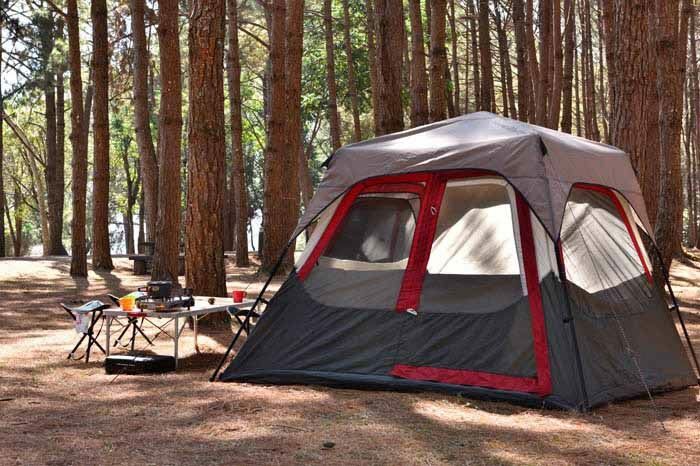 Unfortunately, the tent is also quite expensive and you will only need this tent if you are a true outdoor enthusiast that love camping with the entire family. 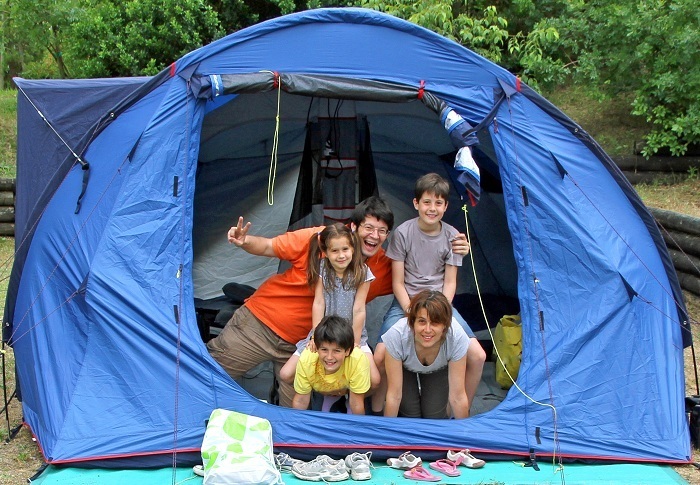 These 6 tents are what we consider the crown jewels of camping in large groups and with multiple people. It is quite hard to choose the overall winner, but after much deliberation, we have chosen the Coleman Evanston Screened Tent for its combination of durability and the fact that it can be instantly set up. Now that you know this, we would like you to share your opinion on the best 6-person tent and let us know if you think we might have missed any of your favorites. 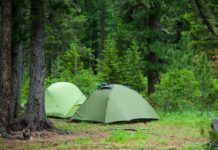 Previous articleThe 5 Best Campground In Yosemite – Find Out Now!